The company innovates around digital while staying true to its brick-and-mortar roots. The automotive sector is a segment where omnichannel expectations are already firmly in place. Bain’s Global Automotive Consumer Survey found that half of customers interested in buying a car begin their journey online. In another survey by Think with Google, 95 percent of car buyers said they will research vehicle information online before even reaching out to a dealer. Therefore, omnichannel success is a necessity for companies like CarMax, which were born before the digital age. “The challenge when you have brick and mortar and digital is how do you change rapidly to be the disruptor in your industry,” says Bryan Ennis, vice president of product at CarMax. Now approaching its 25th anniversary and counting more than $17 billion in revenue for its 2018 fiscal year, CarMax must maintain and grow an online experience that’s expected by savvy and demanding shoppers. To meet these standards, the company is leaning on both technology and human insight by combining machine learning and analytics with a customer-focused culture within its product team. For most families, buying a car is the second largest purchase they’ll make in their lifetime, right behind buying a home. One of the ROI opportunities CarMax uncovered is to leverage data science to curate online vehicle recommendations to deliver a better customer experience. These recommendations help customers find the right car and narrow their choices from nearly 45,000 vehicles. At first, a customer typically has two things in mind when searching for their next vehicle: desirability and affordability. Ennis’ product team leverages AI and machine learning within its proprietary database of information to help gather insight and curate car recommendations. This navigational process filters the choices through brands, mileage, and price ranges to fully customize options, acting as the customer’s own personalized dealer. As technology continues to advance in newer cars, this helps whittle down the choices to fit personal tastes and preferences. Ennis describes it as a self-progression so that the customer doesn’t get trapped looking at 30 vehicles as opposed to the handful they desire. To put it in perspective, CarMax daily generates 50 million car recommendations. Although simply generating recommendations doesn’t mean they are the right ones. The company uses KPIs to measure the success of online vehicle recommendations, such as: Percentage of customers who leverage recommendations as part of their car buying process, percentage that holds or transfers a car, and what percentage runs a finance application. Ennis did not provide specifics on how KPIs are performing. “Data is the building block for personalized experiences, but it must be able to be harnessed,” Ennis says. The company empowers employees to develop solutions to meet the rapidly changing technology and customer landscape. Ennis says he emphasizes ownership and accountability with his staff, reminding them that product managers are the CEOs of their own product and teams who should have a passion for customer experience and the ability to leverage technology and data. CarMax employs a test-and-learn mindset and agile approach. Team members test new ideas, and those that customers react positively to are approved for production. It combines both discovery and delivery in a dual-track agile way. Ennis explains that with minimum viable products, it can get something in front of customers quickly and then continuously refine. With durable teams, the team can optimize the experience for the customer once the product is in market. For example, the company is testing Home Delivery across several stores around Charlotte, NC, which allows customers to shop for and buy a car at their convenience online. And despite the name, the Home Delivery test isn’t just about learning how CarMax can best deliver cars to customers’ homes. 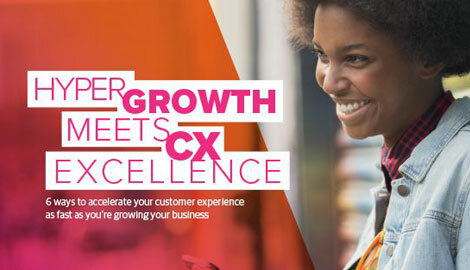 It also evaluates each customer’s unique shopping journey and the transition between online and in-store experiences to find new areas of improvement, Ennis says. From the pilot, CarMax has found that human intervention at the right moment is crucial to delivering a great experience. Explicitly, sales consultant assistance eases friction and spurs purchases during the financial application process. Assistance such as how to leverage down payments to improve APR, increase the use of co-signers to improve financing options, and select vehicles that have better affordability turn more shoppers into buyers, Ennis says. CarMax is also testing expedited pick-up in Charlotte and Lynchburg, VA, stores. In addition, many of CarMax’s innovations are designed to give consumers control throughout the entire car buying experience, based on authenticity. In a Kelley Blue Book study, 90 percent of customers shopping for new vehicles want to see actual photos, as opposed to stock footage. So CarMax recently introduced 360-degree photo technology where the customer can explore the car’s interior in much more detail than before. “It’s an immersive experience where a customer can feel exactly like they are in the car,” Ennis says. Though CarMax has been around for 25 years, it continues to have an entrepreneurial spirit, Ennis says. He encourages companies to think like a startup and always prepare for change, with customers in the center. A key feature of this mindset is to be ready for the unexpected. CarMax calls this the ‘fail fast, fail cheap’ approach. “The word fail gives a lot of companies anxiety,” Ennis says. “At CarMax, we look at failure as a learning opportunity that we can share and grow from across our organization.” He says he doesn’t tell employees how to solve an issue, only what the issue is, why it’s important to solve, and the metrics they need to pursue, without telling them how to do it. This allows for innovative ideas to come to light. Innovation has come in the form of digital transformation that helped operationalize its massive data advantage across channels, anchored by a new CRM system. Now, sales consultants have a unified view of customers’ shopping and selling histories, as well as customer activities completed at every CarMax location. The company plans to deliver an even more seamless online experience to the in-store experience, Ennis says. For example, a customer may visit a store to see a Toyota Camry after just having searched on CarMax.com for other Japanese sedans. With that in mind, the Toyota Camry would be ready at her appointment, but the Nissan Altima and Honda Accord would also be available and ready for test drives. By knowing the customer and her pre-purchase research, the customer develops a better informed car buying experience, Ennis states. 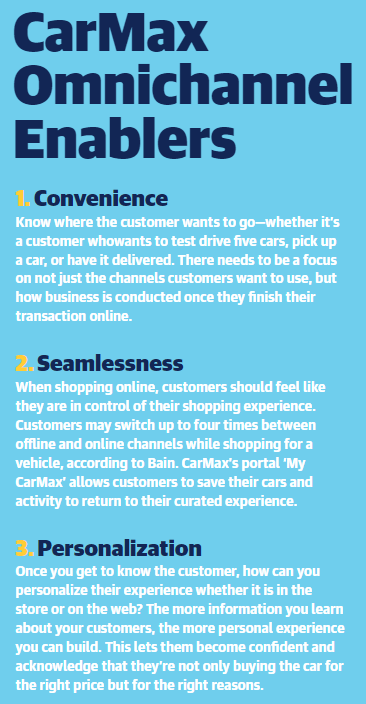 Continued success for CarMax will be about delivering an experience that is personalized for customers in the store, online, or a combination of the two. They will be able to shop on their own terms and CarMax will be prepared to help them at any stage in the transaction.